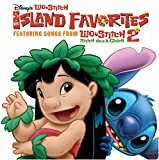 The old Hawaiian way – Paroles de la chanson dans “Lilo & Stitch 2 : Hawaï, nous avons un problème !”. Interprétée par The Big Kahuna. in the great eastern sky. And the evening stars go hidin’ from the day. Oh, the sand and the sea. They come a’callin’ to me. They say good mornin’ in the old Hawaiian way. As my spirit’s taking flight. See the seagulls and the dolphins how they play. Like a pearlon a string. or a bird on the wing. It’s good mornin’ in the old Hawaiian way. in the momin’ light you willsurely see. There’s no place that l’d rather be. Hear the palms begin to sway. As they’re startin’ their day. And a golden rainbow reaches ‘cross the sky. Lovely flowers for your lei. Say good mornin’ in the old Hawaiian way. When l’m thinking of home. And my thoughts start to roam. l can hear the ocean callin’ me to pray. That’s the way to have fun.